Posted March 28, 2019 at 9:18 am . 0 comments. Tamron is offering a $200 savings on popular G2 glass: the Tamron SP 24-70mm f/2.8 Di VC USD G2 is $999.00 and the Tamron SP 70-200mm f/2.8 Di VC USD G2 is $1099.00. This deal is scheduled to expire tomorrow. This deal is available from B&H and Adorama. B&H is including a free filter and a free Tamron USB dock, while quantities last. Adorama is offering a bonus 1% reward with purchase. Posted February 21, 2019 at 10:09 pm . 3 comments. Free shipping (although you have to wait until a March 18th ship date), and Massdrop‘s site indicates that this comes with Tamron’s 6-year warranty. Canon and Nikon mounts are available. A very limited quantity is available — 13, at time of posting. Posted May 23, 2018 at 10:45 pm . 2 comments. Redtagcamera via eBay has a grey market Tamron SP 24-70mm f/2.8 Di VC USD G2 on sale for Memorial Day — it’s now only $929.95, when you apply coupon code “PMEMDAY” in-cart. This deal expires on Friday at 11:59 PM PT. This is for the recent “G2” update to the lens. Note this is likely a grey market lens and a Tamron USA warranty is not guaranteed. Compare with a regular price of $1,199 for the USA version with full warranty. Posted February 2, 2018 at 2:12 pm . 5 comments. This is the “G2” version of the lens, which was released in August 2017. This is a very affordable alternative to the 24-70 II — and it has optical image stabilization! Tamron also has a great $250 educational mail-in rebate on this lens, if you are an instructor or student at select universities or colleges, in a photography-related field of study. That could bring the price of this lens down to potentially $799 after mail-in rebate! Posted December 8, 2017 at 7:48 pm . 9 comments. These are the newer “G2” versions of these lenses. Nikon mounts are also discounted. Posted December 1, 2017 at 7:35 pm . 13 comments. 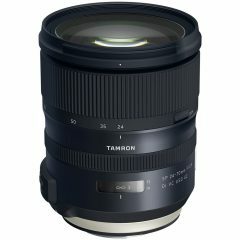 BuyDig is discounting the Tamron SP 24-70mm f/2.8 Di VC USD G2 — it’s now only $1049.00, when you apply coupon code “HOLIDAY150”. You see the discounted price at checkout, on the last page (before you confirm your order.) This is the first major discount for this lens, which regularly goes for $1199. This is the “G2” version of the lens, that was very recently released (in August). This is a very affordable alternative to the 24-70 II — and it has optical image stabilization!